While all races of Men and Mer do the same amount of unarmed damage (base of 4), Khajiit and Argonians do more unarmed damage. 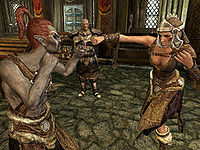 The Khajiit's beginning advantage, granted by their passive claws trait, enables them to deal more damage with fists than with weapons in the early levels of the game. However, these damage values do not improve with the level progression of skills (such as One-Handed) or overall level, meaning eventually unarmed attacks become less effective than attacks with weapons or spells as you continue to improve the relevant skill trees. †The in-game text states that the Claws passive ability adds 15 points to Khajiits' unarmed damage, but the actual effect magnitude is 12. The game data also describes the effect as "Khajiit claws do four times the damage of a man's punch", which is incorrect, as it is actually 5.5 times the damage. In game terms, daggers have a reach of 0.7, one-handed weapons a reach of 1, and two-handed weapons a reach of 1.3; relative to these, all playable races have the same unarmed reach, about 0.68. While the exact speed of unarmed attacks is not known, if it is slower than 1.3 (dagger speed), you can speed it up to dagger speed like with any one-handed weapon, by holding a dagger in your left hand and punching with your right, at the expense of being unable to block. The Fists of Steel perk adds between 10 (iron) and 18 (daedric) to the total unarmed damage you deal when you wear heavy armor gauntlets. The value added to the damage is the base armor value of the gauntlets; thus, improving the quality of such gauntlets by smithing does not increase this value, nor does leveling the Heavy Armor skill. The Dual Flurry and Dual Savagery perks apply to both hands provided at least one hand is holding a weapon; the former will let you punch faster by holding a weapon you don't swing in your other hand (although you will not be able to block), and the latter will apply to both hands (including the unarmed one) during a dual power attack. Even with Savagery, though, your fist will do less damage while dual power attacking than single power attacking. A unique item found within The Ratway, the Gloves of the Pugilist is the only item within the game that contains the Fortify Unarmed Damage enchantment. To maximize unarmed damage, you can disenchant these gloves and then apply the enchantment to both gloves and rings. Sneaking while performing an unarmed strike applies the double damage effect. Vampire lords and werewolves have increased unarmed damage and unarmed reach 1.06, slightly more than one-handed weapons. 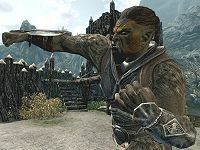 Being a werewolf in beast form sets your base unarmed damage to 20 (meaning Khajiit actually lose damage, since they lose their Claws trait, dropping from 22 to 20, and Argonians gain less benefit than other races) and grants the werewolf additional bonuses to unarmed combat damage depending on character level, from 0 at level 10 or less to 60 at level 50 or more. The Dawnguard add-on added another way to increase the unarmed base damage while being a werewolf by the addition of a specific perk, Bestial Strength. This perk can be chosen multiple times and adds a flat percentage-based damage increase to all damage while in the Werewolf Beast Form, multiplying unarmed damage by 1.25 to 2, depending on number of times taken. Most of your equipment does not apply in beast form, so you lose Fists of Steel if you had it, but you can wear a Dragonborn:Unique_Items#Ring_of_BloodlustDB for another 1.5x multiplier to unarmed damage, at the cost of applying the same multiplier to taken damage. The net effect of all of these is unarmed damage 80 base at level 50, 160 with all of the damage increasing perks, and 120 or 240, respectively, while wearing the Bloodlust ring. Note that being in Beast Form also alters the speed of your unarmed attacks (to be faster), but the exact formula is not known. Being a Lord sets your race to Vampire Lord, which has the same base unarmed damage as Khajiit or Argonians (10), and the same Claws ability as Khajiit, only at magnitude 20, not 12. This will raise your base unarmed damage to 30, an increase of +26 to +8 (7.5x to 1.36x), depending on initial race. Vampire Claws further increase unarmed damage by 0 at level 10 or less to 40 at level 46 or more. The Vampire Lord Perk Tree contains the Poison Talons perk, which increases unarmed damage by 20 points of poison damage. Siding with the Volkihar vampire clan also grants access to the Ring of The BeastDG, which increases unarmed damage by another 20 points. The net effect of all of these is unarmed damage 110 - 90 physical and 20 poison - at level 46 and having the necessary perk and wearing the ring. Taking the Necromage perk in the Restoration tree amplifies Fists of Steel mentioned above by 25% as a vampire, but not while in Vampire Lord form. A brawl is a fistfight in which either party attempts to beat the other until their health is depleted (but not killed). Some NPCs will challenge you to a brawl and some quests require you to challenge an NPC to brawl. Rewards for winning a brawl can include a monetary gain from a bet with your opponent, a reward from a quest giver, obtaining information, and increasing NPCs' disposition towards you. During a brawl, spectators will gather around you and your opponent and shout encouragements or other phrases at you, such as "Fight! Fight! ", "Those fools are actually fighting! ", "Who taught you to fight? Keep those hands up! ", "Drive that snowback to the ground, come on! ", "Remember ... hit the one in the middle! ", "Are you just going to take that? Fight back! ", and "Twelve septims on the big one!" You must fight someone by attacking only with your fists or bashing with a shield until a winner emerges. When combat begins, your weapons and spells automatically unequip. You may use spells like Healing, or a shield, but any damage dealt to your brawling partner other than that from bashing or punching (including the passive effect from the Ebony Mail) will void the fight and count as a crime. The rules of brawling prohibit you from healing an opponent. If you approach a guard in any hold with your fists up, they may say, "You come up to me, fists raised? You looking for a beating?" Alternatively, if you are a Khajiit, they may say, "Sheathe those claws, Khajiit." Unlike earlier TES games, unarmed attacks damage only the health of the recipient, not stamina or magicka. This page was last modified on 14 October 2018, at 04:56.